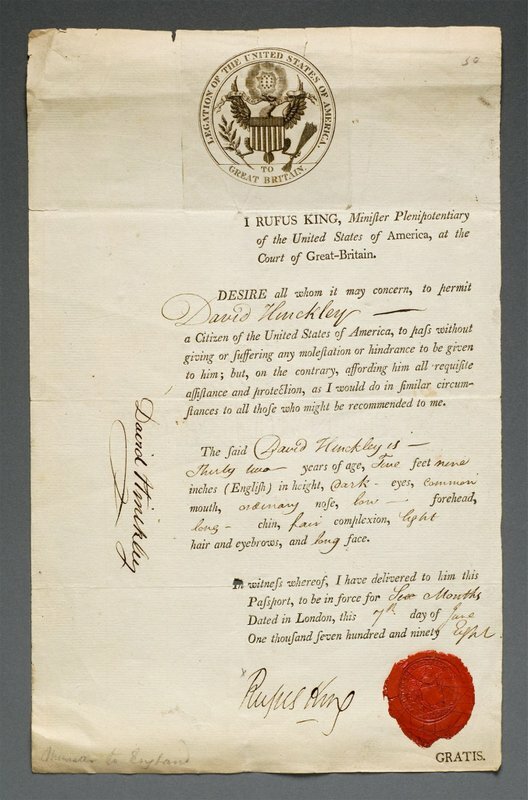 Rufus King, a signer of the U.S. Constitution, also served as a diplomat and authorized this passport, giving David Hinckley permission to “pass without giving or suffering any molestation or hindrance.” Issued in 1798, this is the oldest American artifact in the United States Diplomacy Center collection. From the founding of our nation until 1856 when Congress enacted new passport laws, many government entities issued passports. In addition to those issued by the Secretary of State, U.S. Ministers (called Ambassadors today) and Consuls at diplomatic posts, state governors, and even mayors and local officials distributed passports to U.S. citizens traveling abroad. Nevertheless, many American travelers felt they did not need passports since most foreign states did not require them. This passport is unusual for its time because it includes a physical description of Mr. Hinckley, stating that he is 32 years old, 5’ 9” tall with “dark eyes, light hair, a common mouth, ordinary nose, low forehead, long chin and fair complexion.” His passport was valid only for the standard six months, not a long time in an era when international travel was slow and arduous. Rufus King, who signed David Hinckley’s passport document, was also a founding father of the United States, a Senator from the state of New York, a candidate for president and an ardent abolitionist. He served his first diplomatic post in Great Britain (1796-1803) at the Royal Court of St. James’s Palace, under Presidents John Adams and Thomas Jefferson. His second posting to Great Britain (1825-1826) was under President John Quincy Adams. That’s awsome Guy. By the way the article I refer to is more presicely saying “the oldest document in the archive of the Diplomacy Center”. The first US passport was issued on July 8th 1796. I don’t know if this document still exists.